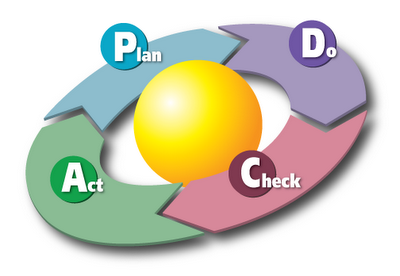 PDCA is an four-step management method used in business for the control and continuous improvement of processes and products. ISO 9001:2008 International Standard promotes the adoption of a process approach and PDCA cycle when developing, implementing and improving the effectiveness of a quality management system, to enhance customer satisfaction by meeting customer requirements. 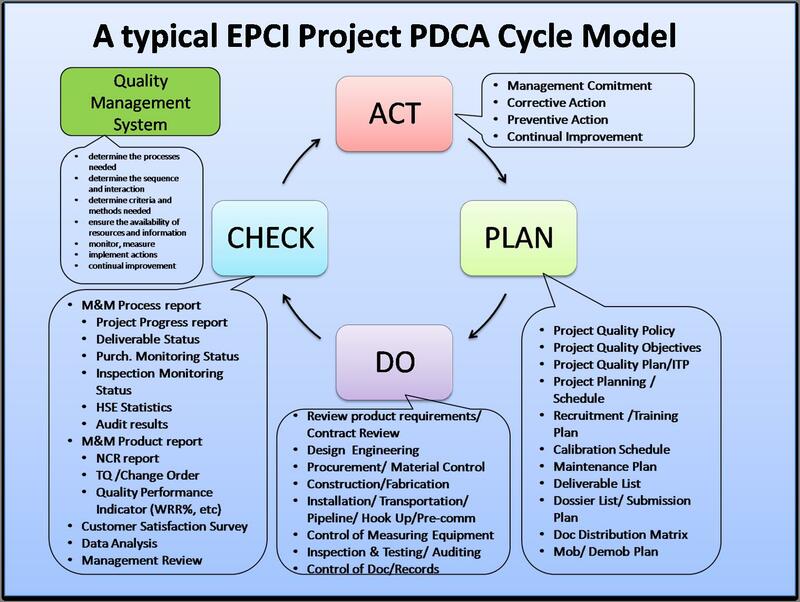 PDCA can be briefly described as follows. In any project, you will first need a detailed plan. Make sure to identify your goals, delegate work properly and set a clear action plan with key milestones. Don’t forget to document your plans in order to help you analyze its effectiveness later. Once you have your plan, do it! As no plan is ever completely perfect, make sure you make a list of problems as you encounter them, and how you responded to them. Once you’ve finished the project, immediately call the team to compile the list of problems and solutions they’ve encountered. Share the information with the team so that everyone knows and understands how to avoid these problems, or to fix them if they happen to reappear again later. You now know the root causes of the problems, now fix them. Your job here is to ensure these problems don’t rear their ugly heads again the next time you carry out this project. Solving an issue by fixing the root cause is like uprooting weeds, as they won’t grow back again. If you solve a problem as they come along, then all you’re doing is cutting weeds. With a bit of time, they’ll just grow back and come back to haunt you. Once the root causes are eliminated, it is important to standardize these techniques in order to ensure that everyone knows about it, and that they don’t happen again. That can be achieved through documentation and sharing this knowledge through PDCA meetings with your team. Why register your company to ISO 9001 . ISO 9001:2008 aims to provide a practical and workable Quality Management System for improving and monitoring all areas of your business. Achieving the standard is not about establishing a set of procedures that are complicated and difficult to manage. With the right support and the knowledge of your employees, you will end up with a system that will improve all areas of your organisation. Implementing an effective and robust Quality Management System (QMS) will help you to focus on the important areas of your business and improve efficiency. The management processes that are established throughout your business will provide a sound foundation, leading to increased productivity and profit. This in turn will improve your customer acquisition and retention. A valid ISO 9001:2008 certificate will be a prerequisite for some of your customers and a “nice to have” for others, when they are considering suppliers. It gives your customers confidence that you are working to standards and procedures that will provide them with a high standard of customer service. The ISO 9001:2008 standard is recognised worldwide and your customers will understand the benefits of working with companies that are ISO 9001:2008 certified. In fact, some of your customers will only do business with certified companies because it gives them assurance that you management systems are constantly assessed and approved. The vendor selection process can be a very complicated and emotional undertaking if you don’t know how to approach it from the very start. Here are five steps to help you select the right vendor for your business. This guide will show you how to analyze your business requirements, search for prospective vendors, lead the team in selecting the winning vendor and provide you with insight on contract negotiations and avoiding negotiation mistakes. The smallest mistake can kill an otherwise productive contract negotiation process. Avoid these ten contract negotiation mistakes and avoid jeopardizing an otherwise productive contract negotiation process. Making suggestions that would stimulate resolution is recommended, where necessary. Your vendors have as much interest in your company’s success as you do. When you make a lot of sales, they make a lot of sales; when you get paid, they get paid. Having reliable and trustworthy vendors can help your business succeed, just as dealing with unreliable or shady firms can cause major setbacks. Start by asking around; other business owners in your area can be a great source of information. Once you’ve got a list of names, call your local Better Business Bureau to find out whether any complaints have been filed against any of the vendors on your list. You can visit vendor Web sites and even tour their physical locations. You can ask for customer testimonials and for product samples as well. The key is to get as much information as possible before you make a large monetary commitment to a vendor you don’t know. As you begin to choose vendors, particularly those who will stock your inventory, try to think of them as business partners. You want to choose the ones with whom your company can develop a long-term, mutually profitable relationship, and that relationship starts with your first request for a price quote. Don’t be afraid to ask vendors for quotes; they’re used to it and they probably expect it. After all, this is a major purchase, and it’s never wise to make a major purchase without shopping around — especially when you’re going to a vendor you’ve never dealt with before. When you’re dealing with a new business and new vendors, make sure to get price quotes from at least two sources for any purchase over $150. If your order will be a lot more than that, consider getting at least three different quotes; more is even better. If you’re having a hard time finding vendors, and an even harder time finding information about them, you can run your own test by placing a very small order, under $100 in total value. If that process goes well, take it up a notch and place a slightly larger order the next time. Once you feel comfortable with the vendor, you can place your full-blown orders without worry. When you want to make a big purchase for your business, you need to know the total cost upfront. To get that information, you need to ask the people who sell whatever it is you want to buy. In order for that information to be fixed (as opposed to changeable), it’s best to get it in writing. When your company is buying a product, that information will come in the form of a quote; when it’s services you’re after, the quote is usually referred to as an estimate. The best way to get a quote is to talk with a salesperson; quote requests that come by mail are often ignored. Phone contact is fine, especially after you’ve begun to build a relationship with that vendor or salesman. For your first time out, though, a face-to-face meeting could prove more fruitful, especially if you’re spending a significant sum. Even though salesmen themselves are seldom involved in setting company pricing policy, they often have some leeway when it comes to closing a deal. When you establish a personal connection with a salesman, he’ll work harder with you and for you; after all, making a sale to you is his bread and butter. Flexible areas often include lower unit pricing when you buy in bulk, and better credit terms. 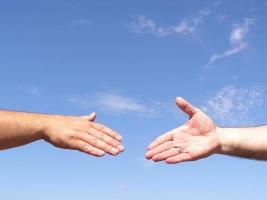 Hitting it off with the salesman is a great start toward developing a good relationship with a vendor. However, don’t stop after getting a single quote just because you like the first salesman you meet with. Another vendor may offer better pricing, better terms, better merchandise, and maybe a salesman that you’ll like even better. If one (or more) of these factors is the norm in your industry, and the vendor in question has gotten high marks from a reliable source, it’s probably safe to keep him on your list. However, if it’s the vendor telling you this is normal practice, and you can’t verify that with anyone else, look for a different vendor. Vendor management allows you to build a relationship with your suppliers and service providers that will strengthen both businesses. Vendor management is not negotiating the lowest price possible. Vendor management is constantly working with your vendors to come to agreements that will mutually benefit both companies. The most important success factor of vendor management is to share information and priorities with your vendors. That does not mean that you throw open the accounting books and give them user IDs and passwords to your systems. Appropriate vendor management practices provide only the necessary information at the right time that will allow a vendor to better service your needs. This may include limited forecast information, new product launches, changes in design and expansion or relocation changes, just to name a few. If a vendor supplies a key part or service to your operation, invite that vendor to strategic meetings that involve the product they work with. Remember, you brought in the vendor because they could make the product or service better and/or cheaper than you could. They are the experts in that area and you can tap into that expertise in order to give you a competitive advantage. Vendor management seeks long term relationships over short term gains and marginal cost savings. Constantly changing vendors in order to save a penny here or there will cost more money in the long run and will impact quality. Other benefits of a long term relationship include trust, preferential treatment and access to insider or expert knowledge. Remember, your vendor is in business to make money too. If you are constantly leaning on them to cut costs, either quality will suffer or they will go out of business. Part of vendor management is to contribute knowledge or resources that may help the vendor better serve you. Asking questions of your vendors will help you understand their side of the business and build a better relationship between the two of you. Good vendor management dictates that negotiations are completed in good faith. Look for negotiation points that can help both sides accomplish their goals. A strong-arm negotiation tactic will only work for so long before one party walks away from the deal. Vendor management is more than getting the lowest price. Most often the lowest price also brings the lowest quality. Vendor management will focus quality for the money that is paid. In other words: value! You should be willing to pay more in order to receive better quality. If the vendor is serious about the quality they deliver, they won’t have a problem specifying the quality details in the contract. The vendor management process begins by selecting the right vendor for the right reasons. The vendor selection process can be a very complicated and emotional undertaking if you don’t know how to approach it from the very start. You will need to analyze your business requirements, search for prospective vendors, lead the team in selecting the winning vendor and successfully negotiate a contract while avoiding contract negotiation mistakes. Once you start to look at individual vendors, be careful that you don’t get blinded by the “glitz and sizzle.” Depending upon the size of the possible contract, they will pull out all the stops in order to get your business. This may include a barrage of overzealous salespeople and “consultants”. Just because they send a lot of people in the beginning, doesn’t mean they will be there after the contract is signed. As you begin your vendor search, ask some questions that will help you eliminate the more obvious misfits. For example, Is the proposed material, service or outsourcing project within the vendor’s area of expertise? Be wary of restrictive or exclusive relationships. For example, limitations with other vendors or with future customers. In addition, contracts that have severe penalties for seemingly small incidents should be avoided. If the vendor asks for an extremely long term contract, you should ask for a shorter term with a renewal option. On the other hand, you should be open to the vendor’s requests also. If an issue is small and insignificant to you but the vendor insists on adding it to the contract you may choose to bend in this situation. This shows good faith on your part and your willingness to work towards a contract that is mutually beneficial to both parties. Once the relationship with the vendor has begun, don’t assume that everything will go according to plan and executed exactly as specified in the contract. The vendor’s performance must be monitored constantly in the beginning. This should include the requirements that are most critical to your business. For example: shipping times, quality of service performed, order completion, call answer time, etc. The bottom line in vendor management best practices is: communication, communication, communication! Don’t assume that the vendor intimately knows your business or can read your mind. A well established and well maintained line of communication will avoid misunderstandings and proactively address issues before they become problems.